Nothing says spring more than white. I hear a lot of women steer clear of white for the fear of looking larger. I find that to be a bogus reason to avoid a color. My philosophy is that I will look my size no matter what color I wear. Anyways, would you believe I have had these pant for 4 years. I bought them, but couldn't fit them. I dropped a few pounds and wah lah! I came across this Shop Ruche, which I thought you would be interested in. 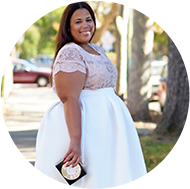 It's an all inclusive boutique that carries plus size. Whoever the buyer is does a great job with the selections and tres' economical price points. 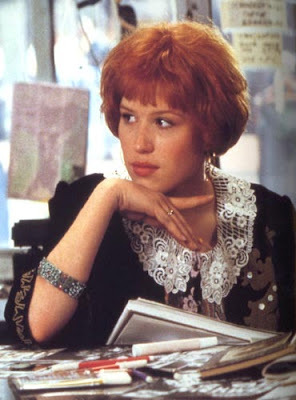 Random thought: Anytime I see someone in something white and chic I think of this line from Pretty in Pink. Blaine: can you tell me what you think of this? Quote: Oh it's hot... white hot!! I love this line even though I'm still not exactly sure what she meant by white hot -- I just assumed if something was white and it was hot..it was white hot...LOL. soooooooooooo pretty I need some white pants in my life! I was one of those ppl who shunned white b/c I thought it would make me larger but last year I bought my first pair of white trouser jeans. I too bought my jeans from Talbots. You look great & colorful. Your outfit is playful & reminds me of the 60s! White hot! lol. You cracked me up. Love the white pants! You look too cute!! Love the outfit! I'm never worried about "looking bigger" when I style my outfits. I wear what I love. I'm a size 18 no matter what I wear, so people can take it or leave it. Ha! Everytime I think about bring out my white pants, it rains. Ugh! Hopefully some time this week it will work out. I never thought about owning white pants but now I feel like I MUST own a pair...they look so great! Also, I love the color combos with the blue top and yellow shoes..brilliant! I just found your blog and am loving it!! White hot is a reference to when most people would barbecue with charcoal... you knew it was time to cook and the charcoal was hot when they turned white. i love white in the spring/summer and agree totally with your philosopy about it. This is very cute - really like the shoes with it. Do you have a Talbots outlet there? I was there the other day and thought of you since you wear them alot. Just discovered this blog recently. I have to say the main thing that attracted me to the blog is that you have a body type similar to mine. I love this outfit and I am not ashamed to wear white pants or show my arms. Great look you have here. Now I need to buy a polka dot top this summer. Honey, you are too fly!! I love White!!! I wear a lot of white during the spring/summer months!! I love white! It's clean and classic and you can pull it off no matter your size! I personally love the way white makes other colors and designs just pop! Good job and cute shirt too. Polka Dots are the BEST....this look reminds me of the 50s, my FAVE era!